The secrets of the Solent seal population have been revealed by a new aerial survey by the Hampshire & Isle of Wight Wildlife Trust, with the support of staff and berth holders at Dean & Reddyhoff’s Haslar Marina. The survey found that a minimum of 49 harbour seals, including 11 pups and 7 grey seals, are currently resident in the Solent. The areas surveyed were Langstone Harbour, Chichester Harbour, Portsmouth Harbour, Ryde sand banks, Beaulieu and Newtown Creek. Hampshire & Isle of Wight Wildlife Trust has been counting the seal population since 1994, when just 3 harbour seals were recorded. The survey takes place each August, when the seals moult and spend more time ashore. The survey was made possible thanks to fundraising by Haslar Marina berth holders and staff, which paid for the flight and sourced the plane and pilot. In addition, over £1000 was made available to the Trust for further local wildlife and environmental work. 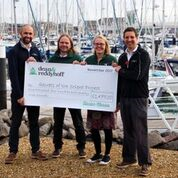 Every year Dean & Reddyhoff staff and customers raise thousands of pounds for local charities at the ever-popular berth holders’ summer parties and through activities like our Big Green Bike Ride. · The Solent harbour seal population is one of the least understood in the country, despite annual surveys and the gathering of ecological data through a previous telemetry study undertaken by HIWWT in collaboration with Chichester Harbour Authority and the Sea Mammal Research Unit (SMRU). HIWWT will continue to focus on gathering data on the Solent’s harbour seal population to inform the conservation and management of this priority species. We hope to shed light on why our local population is increasing whilst elsewhere in the UK harbour seal populations are in decline.